Description: This vase is one you either love or hate. I like it. There is a matching one also on this site. The designs remind me of winter (except the mushroom looking things). The white areas are unglazed and the color is the color of the clay, snow white. 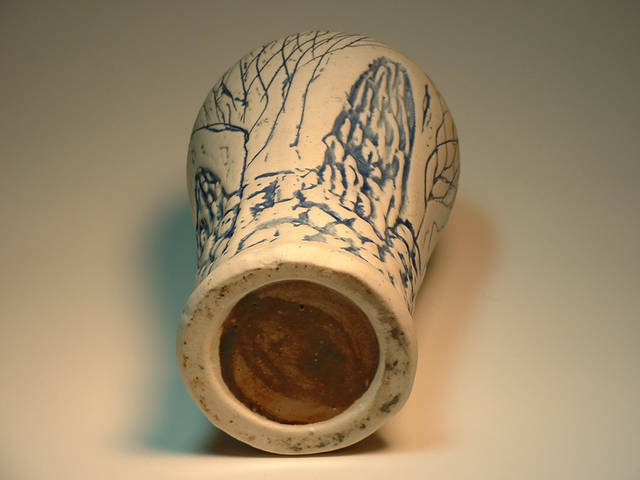 The blue is a cobalt glaze in the carved areas. The inside is glazed with what looks like a standard brown (salt?) glaze. 10" tall. IDed!!! 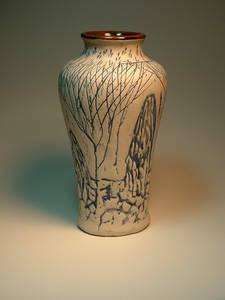 This is a 70's ARTMARK vase made in Japan, as is the other in the same style on this site. These sure fooled me, they are heavy and seem, for all the world, like studio pieces.